Here is a great tip for those scalping Forex: Trading dual timeframes is the key to ensuring low risk entries. 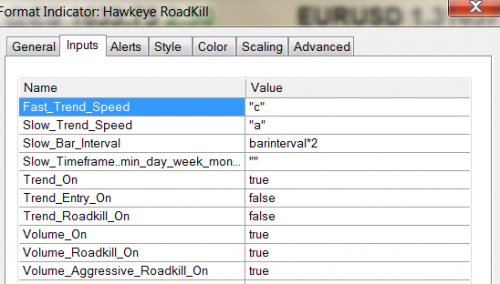 In this chart Roadkill is set to ´aggressive´ and is calculating both 5-minute and 10-minute timeframes. At Point 1 on this chart you can see that the Hawkeye Trend, represented by the cyan dot on the Roadkill indicator, is positive to the upside. An entry at this point results in a 40 pip profit. Not too bad for scalping Forex. Roadkill is showing an uptrend for Volume and Trend on both 5 and 10 minute bars. At Point 2 you can see that the Hawkeye Trend on the Roadkill indicator has gone neutral. The volume is showing professional selling as is Heat Map (indicated by the bright red bars). This is yet another low-risk entry resulting in a further 50 pip profit. Chart 2 shows the inputs that I used for Roadkill in the above trades. Using dual timeframes when scalping Forex is a winner. By patiently waiting for both timeframes to set up, you are substantially lowering your risk of entry. Next PostNext Look at this Consolidation Volume!